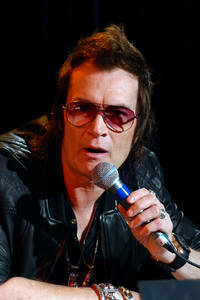 Glenn Hughes (born 21 August 1951) is an English rock bassist and vocalist, best known for playing bass and performing vocals for funk rock pioneers Trapeze, the Mk. III and IV line-ups of Deep Purple, as well as briefly fronting Black Sabbath in the mid-1980s. In addition to being an active session musician, Hughes also maintains a notable solo career. He fronted the supergroup Black Country Communion from 2009 to 2013, and California Breed from late 2013 to early 2015. On 8 April 2016, Hughes was inducted into the Rock and Roll Hall of Fame as a member of Deep Purple. This webpage uses material from the Wikipedia article "Glenn_Hughes" and is licensed under the GNU Free Documentation License. Reality TV World is not responsible for any errors or omissions the Wikipedia article may contain.